BERKELEY, CA � Researchers based at Lawrence Berkeley National Laboratory and the University of California at Berkeley have used a scanning tunneling microscope (STM) to reveal eight-fold patterns of quasiparticle interference in the high-temperature superconductor Bi-2212 (bismuth strontium calcium copper oxide). Bi-2212 under the STM: Fourier transforms of local densities of electronic states show interference patterns evolving as the voltage changes. Electronic interference is known in metals and low-temperature superconductors, but this is the first time the unique eight-fold configuration of quasiparticle interference, predicted by theory, has been seen in high-transition-temperature (high-Tc) superconductors. The discovery calls into question the hypothesis that high-Tc superconductivity necessarily coexists with a peculiar electronic state known as the "stripe phase." Led by J. C. Séamus Davis of Berkeley Lab's Materials Sciences Division, a professor of physics at UC Berkeley and Cornell University, the research group also included participants from the University of Tokyo and Japan's National Institute of Advanced Industrial Science and Technology. They report their findings in the 10 April 2003 issue of the journal Nature. A scanning tunneling microscope constructs images at extremely low temperatures by measuring minute variations in conductance, at a given voltage, between atoms on a surface and the microscope's ultrafine tip. Invented in the 1980s, the STM made it possible to picture and manipulate surface atoms and to form images of the wave patterns of surface electrons. Electrons -- or their equivalent mathematical counterparts, known as quasiparticles (see sidebar) -- scatter from defects in a crystal or from individual impurity atoms. Because of their wavelike nature, the incident and scattered electron waves can interfere to form standing waves. These are visible because the STM directly senses electronic states occupied in a particular place at a particular energy. Scattered electrons form standing waves inside a "quantum corral" of iron atoms on a copper surface. Davis compares the process to photographing ripples in water. "Ripples reflect from the shores of a lake and interfere constructively and destructively, producing standing waves," he says. "On water, standing waves can occur at all possible wavelengths." Davis adds, "We have this water-wave picture in our minds when we first look at electrons in a metal, and indeed this picture is true for simple materials." 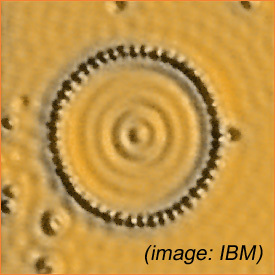 He cites the striking STM images obtained in 1993 by Michael F. Crommie and his colleagues, who confined electrons on a copper surface in a "quantum corral" made of iron atoms. Scattering from the iron and interfering to produce standing waves, the electron waves looked much like water on the surface of a pond. In more complex materials, however, the waves-on-water picture no longer holds and "grows less true as materials grow more complex," says Davis. "For the cuprates -- but not for metals or semiconductors -- at zero energy there are only four possible quantum states that can generate these interferences. As you go away from zero energy, a beautiful thing occurs. Petals open like an eight-fold blossom, into all available quantum states." Angle-resolved photoemission spectroscopy (ARPES) is another technique for studying electronic states of materials; it measures the momentum of electrons knocked out of them by energetic x-rays. Unlike an STM, ARPES cannot measure electronic states at precise locations in real space. Instead, ARPES data yields information about "momentum space" such as the material's band structure and other global electronic properties. "In the past, STM and ARPES were regarded as two extremes in our ability to look at the electronic properties of materials, with very little connection between them," says Berkeley Lab and UC Berkeley theorist Dung-Hai Lee, an author of the Nature report. By applying Fourier transforms -- a technique for translating a complex wave into a spectrum of its constituent frequencies -- to their STM images, Lee says, "we were able to read out tiny variations in the local density of states, tiny changes which contained the momentum-space information. For the first time in a high-Tc material, we showed that measurements characteristic of ARPES, and in excellent agreement with ARPES, can be derived from Fourier transforms of STM images." Bi-2212 momentum space plotted by ARPES: quasiparticle energies increase toward the ends of the banana-shaped regions (red circles). A quasiparticle located near one of these eight regions (top right, for example) is likely to scatter from the others because of their high densities of electronic states. What emerged clearly were relationships between the shape of Bi-2212's Fermi surface, a global electronic property, and peculiar spatial variations of the local densities of states -- caused by including all eight of the momentum-space states that limit and determine the eight-fold pattern of quasiparticle scattering. Quasiparticle scattering is not the only possible source of modulations in the density of electronic states. Almost all high-temperature superconductors are copper oxides (cuprates), "and cuprates are effectively two-dimensional materials, with planes of copper and oxygen atoms interspersed with planes of other kinds of atoms," Lee explains. Periodically spaced "stripes" of charge carriers, separated by insulating regions, are thought to flow in the copper oxygen planes of some cuprates. Interference patterns due to stripes, which may be oriented in either the A or B direction, would not change as STM voltage changes. Where modulations have been observed in cuprates, there has been much disagreement about how to interpret them, Lee says. "One suspicion is a periodic modulation of electron density" caused by one-dimensional stripes of alternately conducting and insulating regions in the plane. Stripes have been observed in several cuprate materials, including high-Tc superconductors like LASCO (lanthanum strontium copper oxide) and YBCO (yttrium barium copper oxide). "In the copper oxide plane, the stripes can point in either the A or B direction," Lee explains. "Modulations caused by them would have a period of four times the crystal lattice constant." 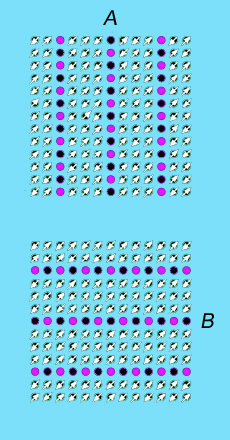 Because "checkerboard" modulations with just these dimensions were previously observed in Bi-2212 by Davis and others, scientists who believe that stripes and superconductivity in the high-Tc cuprates not only coexist but are "inseparable" prefer stripes as an explanation for the observed modulations in Bi-2212. If the modulations were caused by stripes, however, their period would not change with changes in the STM's bias voltage. The eight-fold modulations reported by Davis and his colleagues have a range of distinctive interference patterns, with periods that change as the voltage changes -- strong evidence that they are caused by quasiparticle scattering. "The question remained, could we find a sample of Bi-2212 in which the stripe phase and superconductivity were both present," Lee says. "The answer was no." Davis and his colleagues performed their recent experiments with optimally doped Bi-2212 (optimum doping refers to the right amount of impurity atoms needed to produce superconductivity at the highest possible temperature). Says Lee, "Optimally doped Bi-2212 may provide an example where high-temperature superconductivity exists without stripes." Davis says, "The octet of quantum states we have found provides a remarkably self-consistent description of quasiparticle scattering. No other explanation -- such as competition with another electronic state like the stripe phase -- is needed to explain the patterns we observe." Renewed theoretical effort bolstered by the new Fourier transform technique could make significant progress toward solving the remaining mysteries of the cuprate superconductors -- someday, perhaps, even the basic puzzle of how charge carriers can move without resistance through these otherwise excellent insulators. quasiparticle states in superconducting Bi2Sr2CaCu2O8+ ," by K. McElroy, R. W. Simmonds, J. E. Hoffman, D.-H. Lee, J. Orenstein, H. Eisaki, S. Uchida, and J. C. Davis, appears in the 10 April 2003 issue of Nature. The Berkeley Lab is a U.S. Department of Energy national laboratory located in Berkeley, California. It conducts unclassified scientific research and is managed by the University of California. Visit our website at http://www.lbl.gov. "Imaging quasiparticle interference in Bi2Sr2CaCu2O8+ ," by J. E. Hoffman, K. McElroy, D.-H. Lee, K. M. Lang, H. Eisaki, S. Uchida, and J. C. Davis, Science, 16 August 2002.